Did Harrison Ford Accidentally Audition for the Role of Han Solo in Star Wars? « Did a Play About Daniel Boone Invent the Fiction That he Wore Coonskin Caps? 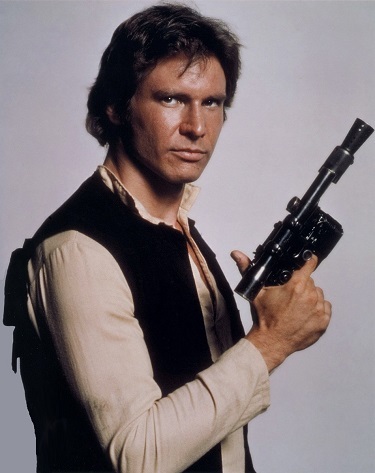 MOVIE URBAN LEGEND: Harrison Ford accidentally auditioned for the role of Han Solo in Star Wars. While he has been lucky enough to play many different roles in a series of blockbuster films over his long movie career, the most important role in Harrison Ford’s career is still likely that of smuggler Han Solo in 1977’s Star Wars. The success of that film directly led to him going from a little-known actor already in his mid-30s to a guy who you would hire to star in your big budget film. With all respect to his other famous role, Indiana Jones, if it were not for Solo we wouldn’t know Harrison Ford’s name today (outside of obsessed American Graffiti fans, of course). Ford eventually had a sort of love/hate relationship with the role that made him a star (as we’ve covered in an old Movie Legends Revealed, he even asked Star Wars Director George Lucas to kill off Han in the third Star Wars film, Return of the Jedi), but he also noted in a Reddit AMA that “Han Solo was also a huge part of my life.” But how did Ford get the chance to play Han Solo in the first place? Did it tie in with his famed early career in carpentry? Read on to find out! In 1964, Ford moved to Hollywood with his then-wife, Mary Marquardt. He soon got a spot at Columbia Pictures’ New Talent program, making $150 a week. His career did not develop much with Columbia and Ford and Columbia ended up parting ways. He signed on with Universal for a similar talent deal. While he did some film work during this period, Ford was soon mostly just doing guest star work on TV shows. Ford later recalled that one of his biggest fears at this point in time was that he would become too well-known as just a guest star on TV shows and that that would eventually kill any chance he had at a film career. To me, one of the attractions of carpentry is that it’s simple and logical. You start at one place and step by step you end up with the finished product. It’s a functional science, and it becomes a form of meditation – the mind is absorbed in simple tasks, you are no longer wrestling within your mind. Ford’s first big carpentry job was building a $100,000 studio for Brazilian band leader Sergio Mendes. Soon Ford was known as the “carpenter to the stars.” Along the way, however, he never lost sight of his desire to still be an actor. Carpentry was basically a way for him to avoid having to do roles that he did not want to do, like all those guest star appearances on TV (although he did still continue to do guest spots here and there). In 1973, Ford appeared in George Lucas’ American Graffiti in a small but notable role (he is the closest the movie comes to having a villain). The movie was a surprise hit. However, it did not result in much of an improvement in his acting career (in the future, I’ll be doing a legend involving Ford and how he got the role in American Graffiti, so keep that in mind). The producer of American Graffiti, Francis Ford Coppola, gave Ford a small role in Coppola’s 1974 film The Conversation as well a small role in his upcoming film Apocalypse Now (Ford filmed his small appearance in 1976, but by the time the film was ultimately released in 1979, Ford has already become a big star). But by 1976, carpentry had become Ford’s primary job (Coppola even hired him to do some carpentry work). Luckily, Fred Roos was not about to give up on Ford. Roos was a producer as well as the casting director on The Godfather and American Graffiti. He became a good friend of Ford’s and was always trying to help Ford’s career out. A few years earlier, he had helped Ford sign on with a talent manager, Patricia McQueeney, who served as Ford’s manager until she passed away in 2005. In 1976, Lucas was casting for his next film, Star Wars. His casting process was an interesting one. Rather than cast each actor individually, he wanted to see how actors would do as a group. He would have different groups of Leia, Luke and Han interact with each other. As it turned out, though, he had five Leias and five Lukes, but he only had four Hans. In stepped Roos, letting Lucas know that Ford was available. So Lucas agreed to bring in Ford, but only for the sake of giving the Luke and the Leia of that group someone to read lines with (I don’t know who his initial group was, as I believe Lucas mixed and matched as he went along, wanting to see how the actors would work in different configurations). Ford had two big strikes against him going into the line-reading. The first was the most obvious, he had been brought in just to read lines, not really audition for the part. The second was that Lucas was adamant about not re-using actors from American Graffiti (it is the same logic that led to him not wanting to cast Ford as Indiana Jones. Lucas didn’t want to have a “cast” of actors like, say, Martin Scorsese has a group of actors he works with a lot, like Robert De Niro). Soon, though, at the urging of everyone around him (including his good friend, fellow director Steven Spielberg and, of course, Roos), Lucas began to seriously consider Ford for the role of Han, as his line readings were continually better than the actors who were “really” auditioning for the role. Finally, Lucas decided to tentatively go with Ford for Han. Even after that decision, though, Lucas began to doubt himself and re-considered another young actor who had auditioned, Christopher Walken. In the end, he decided to offer Ford the role and the rest is film history. This entry was posted on Tuesday, June 16th, 2015 at 3:09 pm	and is filed under Movie Urban Legends Revealed. You can follow any responses to this entry through the RSS 2.0 feed. You can leave a response, or trackback from your own site. I’ll have to look into that Burt Reynolds one some day. It’s not that I don’t believe it or think it’s a crazy idea or anything like that, but Lucas was mostly looking for unknown actors for the three leads, with Alec Guinness and Peter Cushing (to a much lesser extent) being his “name” actors, so Reynolds or Nick Nolte (as I’ve also heard tossed around) seem a bit fishy. Oh yeah, King was just the type of up and comer that Lucas was looking for. There is actual audition footage of King as Han (he was paired with another former American Graffiti actor, Charles Martin Smith, as Luke. Smith looks bizarre as Luke). I’ve never seen audition footage for either Reynolds or Nolte. The most famous actor (at the time) to try out for Han was definitely Kurt Russell, who was still trying to break out of his Disney roots at the time (Snake Plissken was not yet on his resume). Russell’s audition footage (he was paired with William Katt as Luke) was actually quite excellent. Wasn’t Brian DePalma using the same casting sessions to find actors and actresses for CARRIE?